We’re the first to admit that when you think of mushy, gushy, can’t-help-but-hug-and-squeeze-you kind of love, perhaps the Simpsons isn’t the first thing that springs to mind. When you think of love, perhaps the first image isn’t Homer’s undying affection for doughnuts, Patty and Selma’s admirably committed lust for the elusive Macguyver, or Lisa’s loyal relationship with the jazz scene. 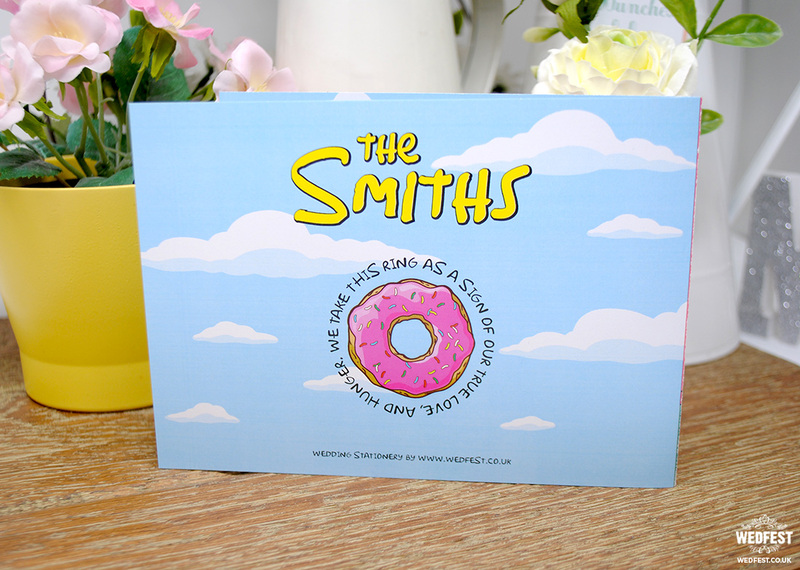 It’s this fabulously obscure and heart-warmingly familiar Simpsons love that makes us so fond of our personalised Springfield-inspired collection, and nothing makes us happier than being able to offer our future brides and grooms a wedding with a difference. 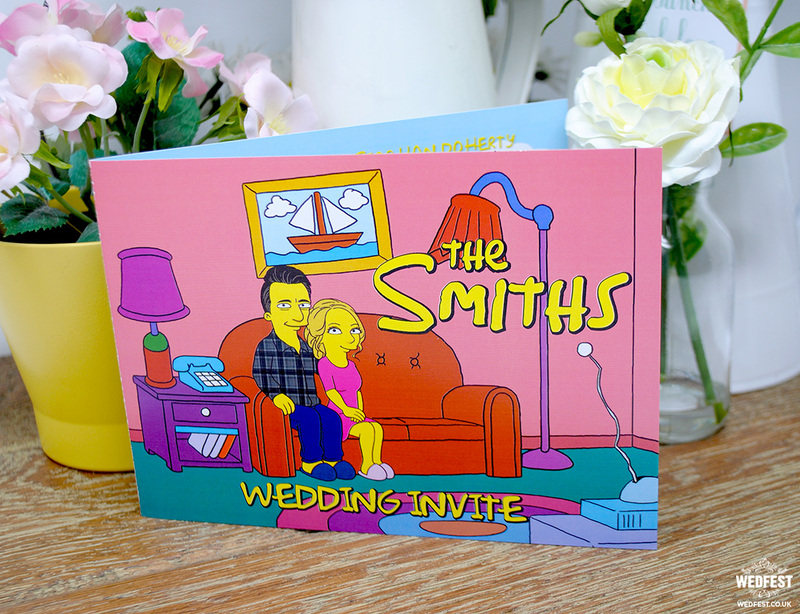 The thoroughly loved up amongst us often find ourselves going pink at the cheeks with romance rather than a spritely yellow, but all that changes with our personalised Simpsons themed wedding invitations. 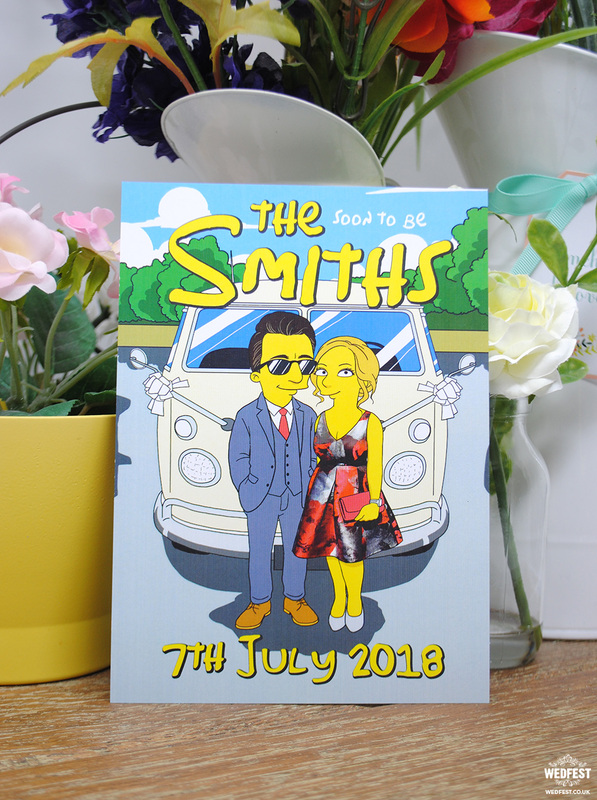 Our team of graphic whizzes transform you – the bride and groom – into your very own Simpsons style yellow characters, to join the ranks of the famous faces that have been featured over the years. We’re very well known for our attention for detail here at Wedfest, and we love to add all of the perfect little touches to our creations to make sure that we’ve perfectly represented you in Springfield. 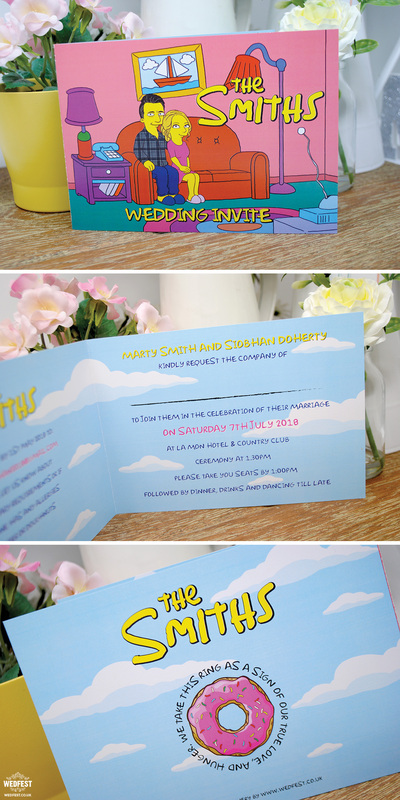 These gorgeous simpsons themed wedding invitations you see for Marty & Siobhan perfectly represent the type of thing thats possible, with the couple sitting together on the famous brown couch. 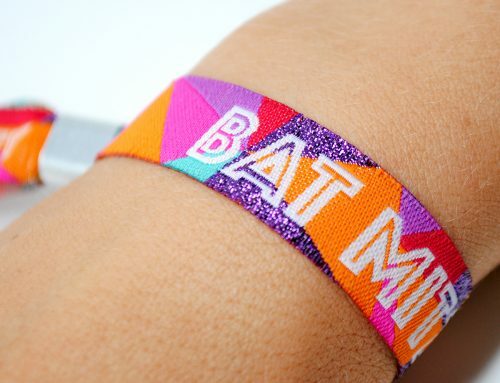 The characters were styled to look like the actual couple but in that awesome yellow character style. 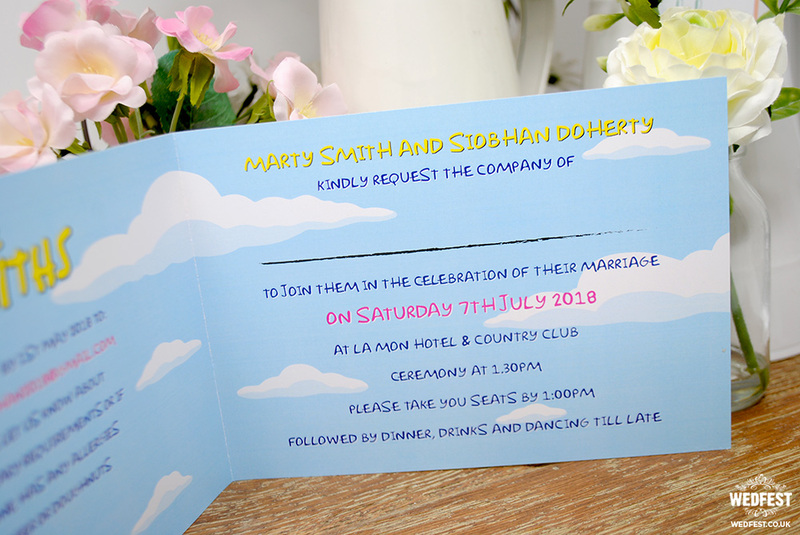 As well as our crowd-pleasing invitations, we also offer a range of accompanying wedding stationery to ensure you can extend the Simpsons theme throughout your wedding experience. These could be wedding save the dates (like the awesome one below), RSVPs, welcome boards at your venue, table plans, place settings, photo backgrounds, thank you cards and more! There’s a wealth of wonderfully nostalgic scenery in Springfield to inspire your big day, and we always work with our loved-up couples to choose the perfect scenes and stories to make your wedding stationery personal to you. 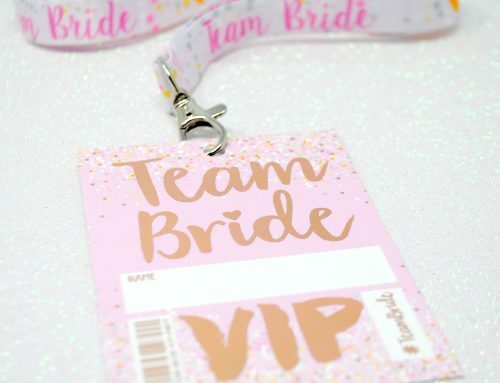 At Wedfest there are so many aspects of our work that give us a thrill, the first of course being the fact we get to share in the fun and enjoyment of creating a wedding day that feels completely in line with each and every one of our customers. This feeling is, for us, matched only by the fact that we see so many of our newlyweds filling their home with the keepsakes we create for the big day, enjoying our special touches for years to come. If you’re scratching your head trying to find the perfect way to make your wedding unique, then – in the words of our favourite troublemaker – “don’t have a cow, man!”. Simply contact us today and we’ll help make your big day one in a billion. 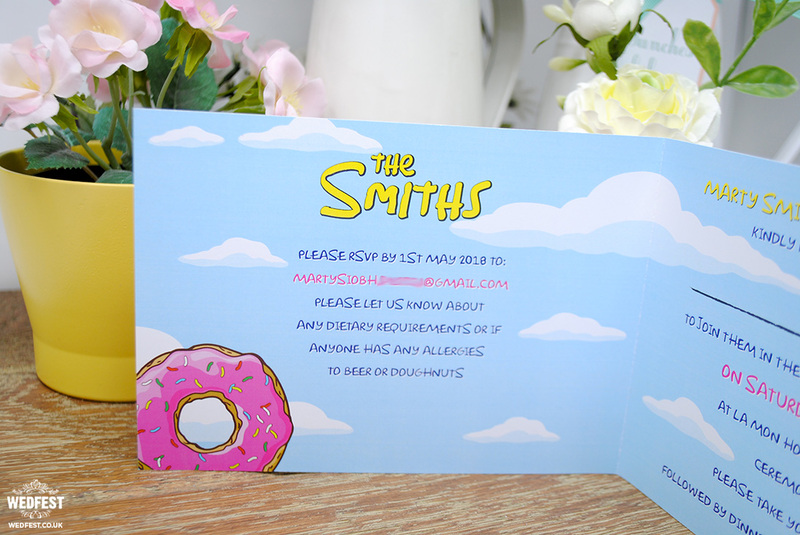 If you like the look of these simpsons themed wedding invitations and would like something similar for your big day, please click here to get in touch.